On to the third of my Aldi tastings now and we’re back in Australia, but this time dealing with something a little bit more special. When reviewing a wine I like to consider all aspects of it and, if having the word ‘Exquisite’ in the name is not enough, this wine hails from the Limestone Coast, which I find quite an exotic term and it transports me immediately to sunnier and foreign climes. For me, I can almost taste the minerality and warmth. The Limestone Coast is fairly obviously named to highlight the geological make-up of the base soils of this region of Southern Australia, and that’s important when knowing that you’re about to try a Chardonnay. Chardonnay is of course a French grape, happiest in the quality wine regions of both Champagne and Burgundy. What may not be so well known is that both of these French regions have a Limestone base, and this bodes extremely well for this wine. As they’ve planted the right grape in the right place you know you’re probably in for a good tasting. The wine is bottled under screw-cap, and I love the effect that the colour scheme has on the overall presentation of the bottle, with the ‘Royal’ blue off-setting the green/yellow of the bottle/contents very well. A nice clean scripted label compliments the whole, which also tells us that this is the product of one year, and that the wine is unoaked. This is an important point, as many New World Chardonnays faced a backlash a few years ago due to the addition of too much wood flavouring to bolster the sometimes neutral flavours of Old World Chardonnay. Upon pouring the wine is a nice clear light straw colour with touches of gold. The nose is good, clear and nicely intense, almost plump (if that’s possible for just a scent). You can immediately understand that this is a rich creamy wine with a clear lemon and lime citrus hit, but also with deep honeyed characters and tropical pineapple. It’s an incredibly fresh sensation which again brings me back to those warm and sunny days, and I swear (if it’s not too wine-geek-fanciful) that I could taste ‘blue skies’. No? Let’s just say then that it is a full, evocative nose. On the palate you again get the sensations of a pleasing density and fullness and, alongside the good weight you get the fresh burst of yellow fruits including lemon, Galia melon, and the aforementioned pineapple. There’s also a touch of florality, and a touch of honey (which I will assume to be the honeysuckle referenced on the label). In addition to the clear fruits, this wine has much more to offer. There’s the added warmth from the 13.5% alcohol, a lush creamy spice (which comes from its time ageing on its yeast) and a discreet smokiness that rounds out the end palate. Overall this is a well-crafted, densely populated wine, and it’s easy to see why it forms part of the ‘Exquisite’ line. The length was equally as impressive as I’d gone away to do something else and realised some five minutes later that I could still taste it. Wonderful stuff. I really like unoaked Chardonnay so didn’t actually pair this with food for this tasting. 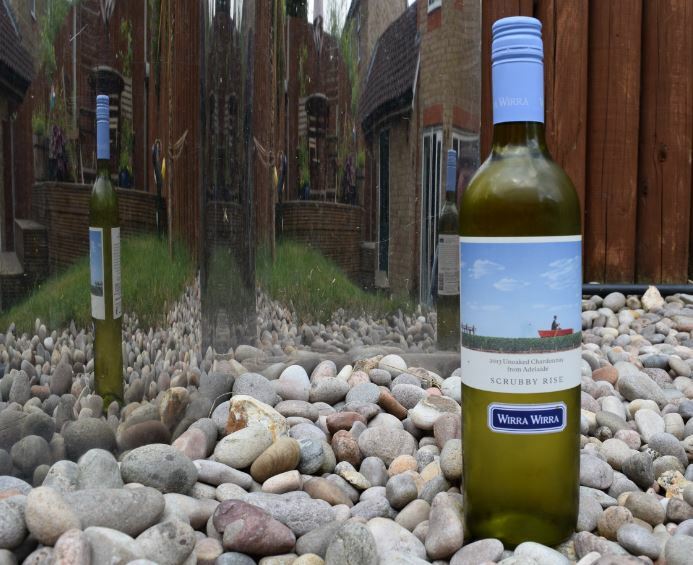 Whilst it was absolutely perfect on its own, the smokiness and richness of the flavours would pair very well with a sauce of the same nature, or seafood and light bites in order to bring out the yellow fruit notes. A sure-fire winner and another one which, at the price-point of £5.79, is truly remarkable value for money. Off to Adelaide in Southern Australia for this months’ tasting note, and to sample the Wirra Wirra Scrubby Rise 2013 Chardonnay. The vineyards were originally established in 1894, but the modern day story starts in 1969 when two cousins (Greg and Roger Trott) re-built the abandoned winery from scratch, and produced their first wines in 1972. Wirra Wirra takes its name from a local tribe who built a viewing platform (nicknamed The Jetty) to look over the majestic Scrubby Rise vineyards below (which are ironically flat and bereft of scrub). 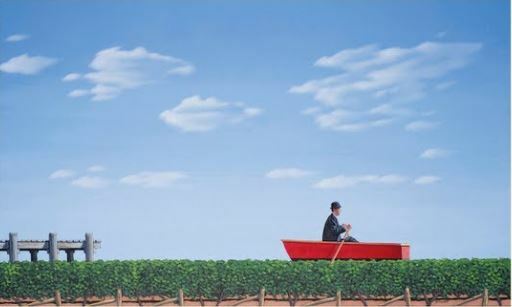 The charming front label artwork by Andrew Baines takes its cue from the fact that The Jetty overlooks a sea of vines as opposed to a body of water, and depicts a bowler-hatted man rowing a red boat through the vineyard. The Scrubby Rise range are the entry level wines for Wirra Wirra, and I was drawn to try this Chardonnay in part due to the fact that they are clear to state that this is an unoaked version. Although heavily oaked Aussie Chardonnays are now firmly a thing of the past and to do an unoaked version is hardly the latest trend, if it’s clearly stated on the label as a taste cue, I find it interesting to see how the producer fills out the palate. The colour of the wine is an inviting pale lemon, with slight green hints to the rim. The nose has a medium intensity of dense yellow tropical fruits, and I can pick up smoky tones and a buttery richness which lets you know that this is Chardonnay through and through. The palate has a decent medium weight to it, and feels extremely round and mouth-filling. Chardonnay is a well-known neutral grape variety, and the fruit notes do indeed play second fiddle to the weightier butter and oil. This gives it a rich and full quality but it hits you first and slightly drowns out the clean lines of the fruit. What fruit I do detect is a continuation of the yellow tropical, such as melon and dried pineapple, along with the generous flesh of stoned fruits such as nectarine (the official notes say white peach, but I’ve never had one, so couldn’t say). There’s a slight touch of lemon citrus in the mix, and I will say that the juicy fruits and refreshing acidity counter balance the richness well. The end palate and finish are then infused with touches of brown spice and a whiff of smoke. As the acidity drops away, a slight sour grapefruit note comes through, and indicates that this is a wine that is the sum of its parts, as opposed to a clean varietal. The finish is commensurately fairly long and brooding. This is an interesting wine and if I didn’t know better, would have said that it had seen at least some older cask ageing. The official tasting notes state that this is a fresh and clean wine, but the net result to me based on this tasting was that the producer had carved a wine that is less about the fruit and more about the tertiary characters (not necessarily just woody notes, but also the rich cream from lees ageing, and the touches of nutmeg spices). Strange. That said, this is an enjoyable entry level wine, with perceptible complexity for the (slightly above) entry level price, and potentially better with food (alas, I tried it on its own). Anyone looking for unoaked Chardonnay in the French style (even accepting the differences in climate) may, however, be disappointed. Many Thanks to Tesco, Wirra Wirra and Gonzalez Byass for the opportunity to taste this wine.